Hedera helix-English Ivy is a true ivy with evergreen foliage which is commonly used for a ground cover. Hedera helix-English Ivy can also climb structures such as walls and fences. It makes a thick, lush carpet and is considered a climbing vine. Water thoroughly but allow soil to dry between waterings. Prefers low to moderate light. Hardy in zones 5-9. This is a Grower's Choice plant and will be chosen from one of the following based on current inventory levels: Ann Marie, Needlepoint, Glacier, Spearpoint, Gold Child or Mint Koliebri. 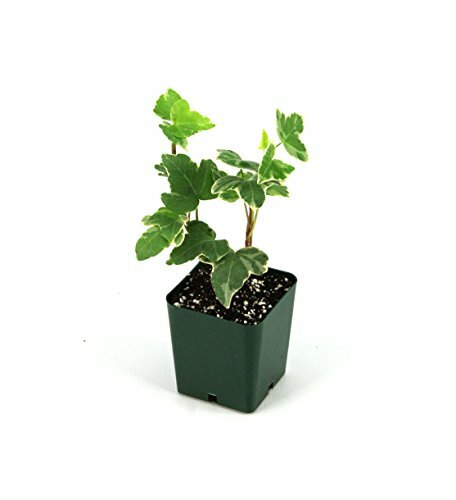 Hedera helix-English Ivy does well in container gardens, terrariums or as a houseplant. Easy care and low light needs makes this vine attractive to indoor gardeners with it's lush, thick foliage and interesting leaf shape and color patterns. Pruning can easily be done to keep it a desirable size. Josh's Frogs offers a wide variety of glass terrariums, container garden soils, drainage layers and other supplies for all of your indoor gardening needs. Hedera helix-English Ivy is not recommended for animal enclosures or tanks. As good practice, Josh's Frogs recommends washing all plants thoroughly removing as much soil as possible with dechlorinated water before placing them in their final home. The plant pictured is in a 2.5" pot. If you have any questions about this product by Sprig & Stone, contact us by completing and submitting the form below. If you are looking for a specif part number, please include it with your message.